Fiber reinforced polymer composites are an extremely broad and versatile class of material.Their high strength coupled with lightweight leads to their use wherever structural efficiency is at a premium. Applications can be found in aircraft, process plants, sporting goods and military equipment. However they are heterogeneous in construction and antisotropic, which makes making strength prediction extremely difficult especially compared to that of a metal. This book brings together the results of a 12year worldwide failure exercise encompassing 19 theories in a single volume. Each contributor describes their own theory and employs it to solve 14 challenging problems. The accuracy of predictions and the performance of the theories are assessed and recommendations made on the uses of the theories in engineering design. All the necessary information is provided for the methodology to be readily employed for validating and benchmarking new theories as they emerge. Brings together 19 failure theories, with many application examples. Compares the leading failure theories with one another and with experimental data Failure to apply these theories could result in potentially unsafe designs or over design. 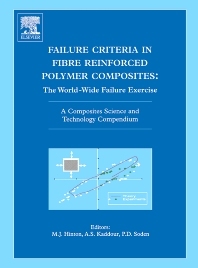 The Worldwide Failure Exercise:Its Origin And Content; Test Cases And Experimental Results Under Biaxial Loads; Description Of The Individual Failure Theories By Their Originators; A Comparative Study Of Failure Theories And Predictions For Fiber Polymer Composite Laminates: Part A; Comparison Between The Individual Theoretical Predictions And Experimental Results; Predictive Capabilities Of Nineteen Failure Theories And Design Methodologies For Polymer Composite Laminates: Part B: Comparison With Experiments; Recommendations For Designers And Researchers Resulting From The Worldwide Failure Exercise.